One of the most common concerns when it comes to skylights is water. Will it leak? How good are the seals? What if it really rains hard? What about condensation? These are all good questions and they all relate to the same issue: weepage. In the early years of sloped glazing it was common for any kind of glazed structure to become increasingly leaky over time. It was just a part of having a roof opening covered with a glass structure. Along with the water comes the mildew or mold forming where water has not completely drained off. And, if moisture was allowed to collect around the skylight, it could become a health concern, especially in areas of high humidity like swimming pool enclosures. With the advances made in sealing, flashings and extrusions, the problem of adequate drainage has been greatly diminished. Functionally, any sloped glazing is a roof. So the potential exposure to rainwater with a skylight is greater than on any vertical window surfaces. Any water in the form of leakage or condensation must not be allowed to collect within the unit and should drain out quickly and efficiently. Nothing is completely impervious to water but if you can manage these four items correctly, you’ll greatly reduce any problems with moisture collecting and leaking. And, a good engineering team is a must to assure you’ve got the right slope, flashing and seal to keep the unit as waterproof as possible. While most seals and flashing are similar between glazing units, the type of rafter will vary from one company to another. As they say, the devil is in the details and this is where you’ll want to really look at a side by side comparison. With Crystal Structures, our rafters include specially designed gutters or “TearDucts”™ within the extrusion that channels water away from the glazing and out to the drainage system. No other company offers this type of detail in the extrusion. With rafters from other glazing companies, any water or condensation is channeled to dead ends within the system causing water to stand or back up. To prevent the problem of standing water, weepage holes must be drilled at regular intervals. 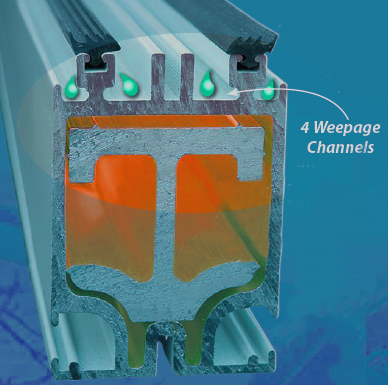 Our glazed systems have been designed so moisture will weep to the outside by collecting into one of four Tearducts™ and flowing down through the structure to the drainage exit. Weepage holes are kept to a minimum. All structures will create condensation and our system has been designed to deal with it. When installed correctly our system will drain moisture down to the sill where it’s then forced to the outside. Effective drainage and our Tearduct™ system is just one reason to choose Crystal Structures for your next sloped glazing project.